Japan is divided into 47 prefectures (都道府県, Todōfuken), forming the first level of jurisdiction and administrative division. 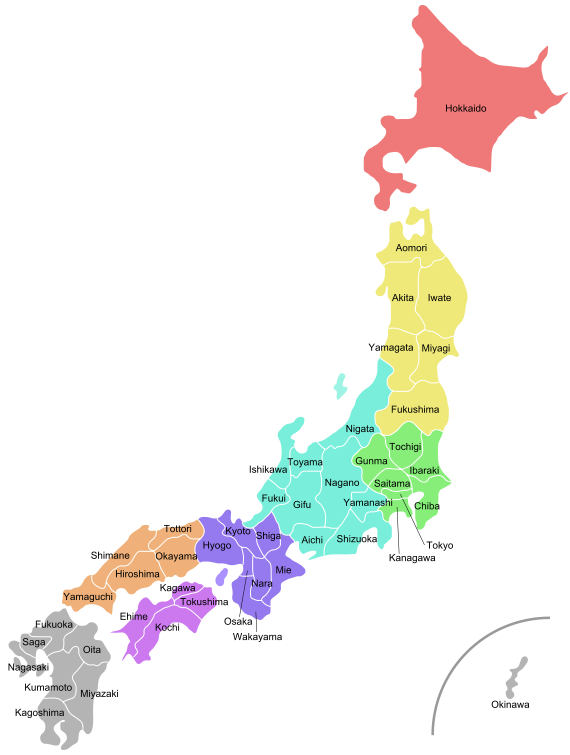 They consist of 43 prefectures (県, ken) proper, two urban prefectures (府, fu, Osaka and Kyoto), one "circuit" or "territory" (道, dō, Hokkaido) and one "metropolis" (都, to, Tokyo). The Meiji Fuhanken sanchisei administration created the first prefectures (urban -fu and rural -ken) from 1868 to replace the urban and rural administrators (bugyō, daikan, etc.) in the parts of the country previously controlled directly by the shogunate and a few territories of rebels/shogunate loyalists who had not submitted to the new government such as Aizu/Wakamatsu. In 1871, all remaining feudal domains (han) were also transformed into prefectures, so that prefectures subdivided the whole country. In several waves of territorial consolidation, today's 47 prefectures were formed by the turn of the century. In many instances, these are contiguous with the ancient ritsuryō provinces of Japan. Each prefecture's chief executive is a directly-elected governor (知事, chiji). Ordinances and budgets are enacted by a unicameral assembly (議会, gikai) whose members are elected for four-year terms. Under a set of 1888–1890 laws on local government until the 1920s, each prefecture (then only 3 -fu and 42 -ken; Hokkai-dō and Okinawa-ken were subject to different laws until the 20th century) was subdivided into cities (市, shi) and districts (郡, gun) and each district into towns (町, chō/machi) and villages (村, son/mura). Hokkaido has 14 subprefectures that act as branch offices (総合振興局, sōgō-shinkō-kyoku) and branch offices (振興局, shinkō-kyoku) of the prefecture. Some other prefectures also have branch offices that carry out prefectural administrative functions outside the capital. Tokyo, the capital of Japan, is a merged city-prefecture; a metropolis, it has features of both cities and prefectures. Under chapter 8 of the postwar constitution and the 1947 Local Autonomy Law, Japan is subdivided into 47 prefectures (1 -to, 1 -dō, 2 -fu, 43 -ken), largely equal in autonomy although the [Tōkyō]-to retains some additional municipal authority for part of its territory (former Tokyo City), and there is central government intervention in its own autonomy (police chief) because of its capital functions. All prefectures are further subdivided into municipalities: cities (-shi), towns (-machi/-chō), villages (-mura/-son) and [special] wards ([tokubetsu]-ku; not to be confused with the wards of designated cities, the latter are administrative subdivisions below municipalities). The institutions (a chief executive and a legislative assembly directly elected separately for four-year terms) – and mechanisms (by-laws/ordinances, jōrei, executive ordinances, kisoku, popular petitions, initiatives and recalls, chokusetsu seikyū (lit. "direct demands")) of local autonomy are largely the same for all prefectures and municipalities. However the extent of municipal autonomy varies by type, in descending order: three special forms for large cities (major cities designated by government order, core cities, special case cities), ordinary cities, towns and villages. The special wards are in a special category: in some areas (e.g. municipal elections), they are treated like major cities, in others (taxation), they have less autonomy than villages. in many policy areas, the basic framework is set tightly by national laws, and prefectures and municipalities are only autonomous within that framework. In recent decades, there have been several reforms to try to reduce the fiscal dependency of local governments. By fiscal 2007, prefectural and municipal taxes constituted 43.3% of the total tax revenue, while prefectural and municipal governments accounted for 58.9% of total government spending; central government transfers and loans still cover a substantial part of local expenditures. The West's use of "prefecture" to label these Japanese regions stems from 16th-century Portuguese explorers' and traders' use of "prefeitura" to describe the fiefdoms they encountered there. Its original sense in Portuguese, however, was closer to "municipality" than "province". Today, in turn, Japan uses its word ken (県), meaning "prefecture", to identify Portuguese districts while in Brazil the word "Prefeitura" is used to refer to a city hall. Those fiefs were headed by a local warlord or family. Though the fiefs have long since been dismantled, merged, and reorganized multiple times, and been granted legislative governance and oversight, the rough translation stuck. The Meiji government established the current system in July 1871 with the abolition of the han system and establishment of the prefecture system (廃藩置県, haihan-chiken). Although there were initially over 300 prefectures, many of them being former han territories, this number was reduced to 72 in the latter part of 1871, and 47 in 1888. The Local Autonomy Law of 1947 gave more political power to prefectures, and installed prefectural governors and parliaments. In 2003, Prime Minister Junichiro Koizumi proposed that the government consolidate the current prefectures into about 10 regional states. The plan called for each region to have greater autonomy than existing prefectures. This process would reduce the number of subprefecture administrative regions and cut administrative costs. The Japanese government is also considering a plan to merge several groups of prefectures, creating a subnational administrative division system consisting of between nine and 13 states, and giving these states more local autonomy than the prefectures currently enjoy. As of August 2012[update], no reorganization has been scheduled. Japan is a unitary state. The central government delegates many functions (such as education and the police force) to the prefectures and municipalities, but retains the overall right to control them. Although local government expenditure accounts for 70 percent of overall government expenditure, the central government controls local budgets, tax rates, and borrowing. Historically, during the Edo period, the Tokugawa shogunate established bugyō-ruled zones (奉行支配地) around the nine largest cities in Japan, and 302 township-ruled zones (郡代支配地) elsewhere. When the Meiji government began to create the prefectural system in 1868, the nine bugyō-ruled zones became fu (府), while the township-ruled zones and the rest of the bugyo-ruled zones became ken (県). Later, in 1871, the government designated Tokyo, Osaka, and Kyoto as fu, and relegated the other fu to the status of ken. During World War II, in 1943, Tokyo became a to, a new type of pseudo-prefecture. Despite the differences in terminology, there is little functional difference between the four types of local governments. The subnational governments are sometimes collectively referred to as to-dō-fu-ken (都道府県) in Japanese, which is a simple combination of the four terms. Osaka and Kyoto Prefectures are referred to as fu (府). The Classical Chinese character from which this is derived implies a core urban zone of national importance. Before World War II, different laws applied to fu and ken, but this distinction was abolished after the war, and the two types of prefecture are now functionally the same. 43 of the 47 prefectures are referred to as ken (県). The Classical Chinese character from which this is derived carries a rural or provincial connotation, and an analogous character is used to refer to the counties of China, counties of Taiwan and districts of Vietnam. Hokkaido, the only remaining dō today, was not one of the original seven dō (it was known as Ezo in the pre-modern era). Its current name is believed to originate from Matsuura Takeshiro, an early Japanese explorer of the island. Since Hokkaido did not fit into the existing dō classifications, a new dō was created to cover it. The Meiji government originally classified Hokkaido as a "Settlement Envoyship" (開拓使, kaitakushi), and later divided the island into three prefectures (Sapporo, Hakodate, and Nemuro). These were consolidated into a single Hokkaido Department (北海道庁, Hokkaido-chō) in 1886, at prefectural level but organized more along the lines of a territory. In 1947, the department was dissolved, and Hokkaido became a full-fledged prefecture. The -ken suffix was never added to its name, so the -dō suffix came to be understood to mean "prefecture." When Hokkaido was incorporated, transportation on the island was still underdeveloped, so the prefecture was split into several "subprefectures" (支庁, shichō) that could fulfill administrative duties of the prefectural government and keep tight control over the developing island. These subprefectures still exist today, although they have much less power than they possessed before and during World War II. They now exist primarily to handle paperwork and other bureaucratic functions. "Hokkaido Prefecture" is, technically speaking, a redundant term because dō itself indicates a prefecture, although it is occasionally used to differentiate the government from the island itself. The prefecture's government calls itself the "Hokkaido Government" rather than the "Hokkaido Prefectural Government". Tokyo is referred to as to (都), which is often translated as "metropolis." The Japanese government translates Tōkyō-to as "Tokyo Metropolis" in almost all cases, and the government is officially called the "Tokyo Metropolitan Government". Following the capitulation of shogunate Edo in 1868, Tōkyō-fu (an urban prefecture like Kyoto and Osaka) was set up and encompassed the former city area of Edo under the Fuhanken sanchisei. After the abolition of the han system in the first wave of prefectural mergers in 1871/72, several surrounding areas (parts of Urawa, Kosuge, Shinagawa and Hikone prefectures) were merged into Tokyo, and under the system of (numbered) "large districts and small districts" (daiku-shōku), it was subdivided into eleven large districts further subdivided into 103 small districts, six of the large districts (97 small districts) covered the former city area of Edo. When the ancient ritsuryō districts were reactivated as administrative units in 1878, Tokyo was subdivided into 15 [urban] districts (-ku) and initially six [rural] districts (-gun; nine after the Tama transfer from Kanagawa in 1893, eight after the merger of East Tama and South Toshima into Toyotama in 1896). Both urban and rural districts, like everywhere in the country, were further subdivided into urban units/towns/neighbourhoods (-chō/-machi) and rural units/villages (-mura/-son). The yet unincorporated communities on the Izu (previously part of Shizuoka) and Ogasawara (previously directly Home Ministry-administrated) island groups became also part of Tokyo in the 19th century. When the modern municipalities – [district-independent] cities and [rural] districts containing towns and villages – were introduced under the Yamagata-Mosse laws on local government and the simultaneous Great Meiji merger was performed in 1889, the 15 -ku became wards of Tokyo City, initially Tokyo's only independent city (-shi), the six rural districts of Tokyo were consolidated in 85 towns and villages. In 1893, the three Tama districts and their 91 towns and villages became part of Tokyo. As Tokyo city's suburbs grew rapidly in the early 20th century, many towns and villages in Tokyo were merged or promoted over the years. In 1932, five complete districts with their 82 towns and villages were merged into Tokyo City and organized in 20 new wards. Also, by 1940, there were two more cities in Tokyo: Hachiōji City and Tachikawa City. In 1943, Tokyo City was abolished, Tōkyō-fu became Tōkyō-to, and Tokyo's 35 wards remained Tokyo's 35 wards, submunicipal authorities falling directly under the municipality, but since the municipality was abolished, Tokyo's wards fell directly under prefectural or now "Metropolitan" authority. All other cities, towns and villages in Tokyo stayed cities, towns and villages in Tokyo. The reorganization's aim was to consolidate the administration of the area around the capital by eliminating the extra level of authority in Tokyo. Also, the governor was no longer called chiji, but chōkan (~"head/chief [usually: of a central government agency]") as in Hokkaidō). The central government wanted to have greater control over all local governments due to Japan's deteriorating position in World War II – for example, all mayors in the country became appointive as in the Meiji era – and over Tokyo in particular, due to the possibility of emergency in the metropolis. After the war, Japan was forced to decentralize Tokyo again, following the general terms of democratization outlined in the Potsdam Declaration. Many of Tokyo's special governmental characteristics disappeared during this time, and the wards took on an increasingly municipal status in the decades following the surrender. Administratively, today's special wards are almost indistinguishable from other municipalities. The postwar reforms also changed the map of Tokyo significantly: In 1947, the 35 wards were reorganized into the 23 special wards, because many of its citizens had either died during the war, left the city, or been drafted and didn't return. In the occupation reforms, special wards, each with their own elected assemblies (kugikai) and mayors (kuchō), were intended to be equal to other municipalities even if some restrictions still applied. (For example, there was during the occupation a dedicated municipal police agency for the 23 special wards/former Tokyo City, yet the special wards public safety commission was not named by the special ward governments, but by the government of the whole "Metropolis". In 1954, independent municipal police forces were abolished generally in the whole country, and the prefectural/"Metropolitan" police of Tokyo is again responsible for the whole prefecture/"Metropolis" and like all prefectural police forces controlled by the prefectural/"Metropolitan" public safety commission whose members are appointed by the prefectural/"Metropolitan" governor and assembly.) But, as part of the "reverse course" of the 1950s some of these new rights were removed, the most obvious measure being the denial of directly elected mayors. Some of these restrictions were removed again over the decades. But it was not until the year 2000 that the special wards were fully recognized as municipal-level entities. Independently from these steps, as Tokyo's urban growth again took up pace during the postwar economic miracle and most of the main island part of Tokyo "Metropolis" became increasingly core part of the Tokyo metropolitan area, many of the other municipalities in Tokyo have transferred some of their authority to the Metropolitan government. For example, the Tokyo Fire Department which was only responsible for the 23 special wards until 1960 has until today taken over the municipal fire departments in almost all of Tokyo. A joint governmental structure for the whole Tokyo metropolitan area (and not only the western suburbs of the special wardswhich are part of the Tokyo prefecture/Metropolis") as advocated by some politicians such as former Kanagawa governor Shigefumi Matsuzawa has not been established (see also Dōshūsei). Existing cross-prefectural fora of cooperation between local governments in the Tokyo metropolitan area are the Kantō regional governors' association (Kantō chihō chijikai) and the "Shutoken summit" (formally "conference of chief executives of nine prefectures and cities", 9 to-ken-shi shunō kaigi). But, these are not themselves local public entities under the local autonomy law and national or local government functions cannot be directly transferred to them, unlike the "Union of Kansai governments" (Kansai kōiki-rengō) which has been established by several prefectural governments in the Kansai region. There are some differences in terminology between Tokyo and other prefectures: police and fire departments are called chō (庁) instead of honbu (本部), for instance. But the only functional difference between Tōkyō-to and other prefectures is that Tokyo administers wards as well as cities. Today, since the special wards have almost the same degree of independence as Japanese cities, the difference in administration between Tokyo and other prefectures is fairly minor. In Osaka, several prominent politicians led by Tōru Hashimoto, then mayor of Osaka City and former governor of Osaka Prefecture, proposed an Osaka Metropolis plan, under which Osaka City, and possibly other neighboring cities, would be replaced by special wards similar to Tokyo's. The plan was narrowly defeated in a 2015 referendum. See this Japanese Wikipedia article for all the changes in that period. See also the English Wikipedia List of Japanese prefectures by population#Historical demography of prefectures of Japan for lists of prefectures since the late 1860s. ^ a b Nussbaum, Louis-Frédéric, 2002: "Provinces and prefectures" in Japan encyclopedia, p. 780. ^ "An Outline of Local Government in Japan" (PDF). ^ Mabuchi, Masaru, "Municipal Amalgamation in Japan", World Bank, 2001. ^ "Doshusei Regional System" Archived 2006-09-26 at the Wayback Machine National Association for Research Advancement. ^ Mochida, "Local Government Organization and Finance: Japan", in Shah, Anwar (2006). Local Governance in Industrial Countries. World Bank. ^ 都庁の所在地 Archived 2014-04-19 at the Wayback Machine Shinjuku is the location of the Tokyo Metropolitan Government Office.But Tokyo is not a "municipality". Therefore, for the sake of convenience, the notation of prefectural is "Tokyo". ^ Post-war administrative division changes are not reflected in this table. The capital of the former Japanese administration is not necessarily the capital of the present-day equivalent. ^ Due to the division of Korea, Kōgen (Kangwon/Gangwon), Keiki (Gyeonggi) and Kōkai (Hwanghae) are divided between North Korea and South Korea. While each Korea has its own Kangwon/Gangwon Province, the North Korean portion of Gyeonggi and the South Korean portion of Hwanghae have been absorbed into other provinces. ^ Shunsen (Chuncheon) is in present-day South Korea. ^ Leased from Qing dynasty, subsequently Republic of China and Manchukuo. ^ After World War II, the Soviet Union occupied the territory. The Soviet Union turned it over to the People's Republic of China in 1955. 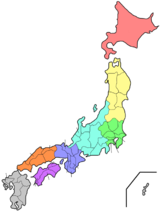 Wikimedia Commons has media related to Prefectures of Japan.